Yuzuru has a lot of fans that are young and active on Twitter, because it's a niche interest so online communities are the only place you can really discuss the sport, plus we've got motivation because FS is a sport that is often overlooked. The difficulty of the sport is under-estimated. Our stars are under-valued. We have that push to make our voices heard. Also, I don't think it's unfair to compare Yuzuru's fandom with Kpop, particularly in this case. Kpop fandoms have to be really internet savvy and frequently utilise highly organised mass streaming events or voting campaigns. That's why a Kpop group can get a million more votes than Justin Beiber for an MTV choice award or something. A lot of western music fans just don't have the same degree of online presence OR just don't have that use of the internet drilled into them, since KPOP fans do this basically daily for 3-4 weeks during a promotional period to try to get their faves a win on the music shows. A fair number of Yuzuru's fans, newer fans at least, have that kind of fandom background. I'm sure a decent chunk of his Japanese and Chinese fans are used to this kind of behaviour tbh. And even if not, that is kinda what we are doing - kinda organising for fans to go and just be loud about wanting Yuzuru to win even if it doesn't work out to be a real voting situation. She did well! Her FS was really good! I think she finished 5th or 6th? He won't be Yuzuru should sue for libel/slander. I'm so angry at the cosplayer guy and the media dragging Yuzuru into it. Of course he has been quietly engaged in charity for 4 years helping children in Sendai to skate. No bragging. No fanfare. Just putting money into the rink so the resources are there, and running a fund to help kids access those resources. He is such a good, warm-hearted person and he has really given so much to Japan and the sport. I'm not so worried about GOE because Nathan should struggle to get above a 3 and shouldn't get close to a 5 without some kind of miracle and even if he did get 4s on his jumps...he can't in his steps and spins. Besides, he's only capable of hitting those high GOEs on maybe 1 or 2 elements. Shoma is in the same boat GOE wise but he can get high GOE on his steps and spins and earns decent PCS. Nathan receives good PCS and is bound to get heaps of bonuses if he lands enough quads but he's never going to score on par with Yuzu unless the judges just give up even attempting to seem credible. Average skate vs Average skate, Yuzuru should outscore in GOE. Best vs Best....sorry but no one should come close. 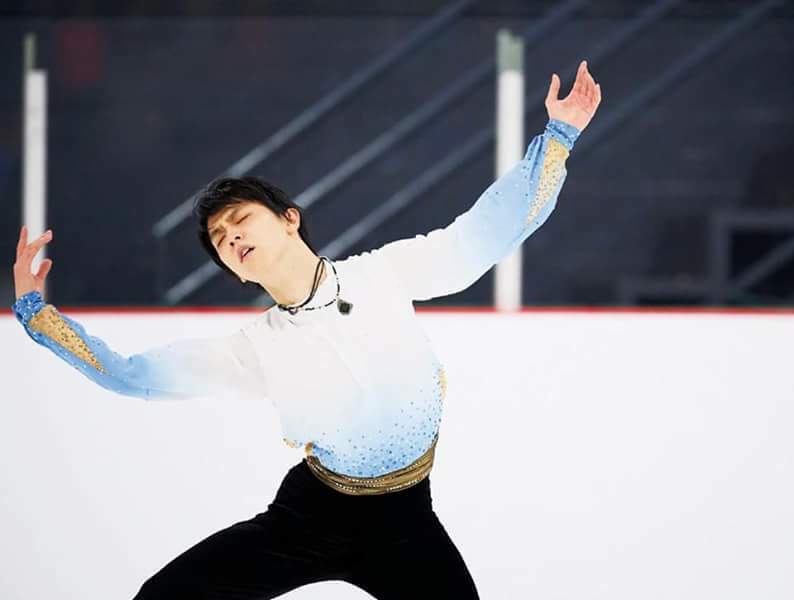 I agree, with a change in mindset I think Yuzuru will be much stronger At the very least, strong in a different way, since he's always been strong. More finding that he can succeed without that feeling of being backed into a corner and that his true best can be found when he is skating with joy and passion, not out of desperation. On Yuzuru's English: I'd say he's maybe intermediate level since he has a fair grasp on sentence construction and a decent variety of vocabulary including technical terms within his field but also some beyond-the-basic words for general, everyday use. He does make some grammatical errors or lose a word or struggle to communicate exactly what he's thinking, so he is not fluent, but with some studying or things like watching tv with the purpose of developing his English, he could get there. His pronunciation is good though not always totally clear, clear enough that it's not a problem though. I do get the impression that the English he has is the English he's picked up through immersion more than actively studying. If he does study English, I'd hazard a guess that he maybe doesn't study often or particularly seriously and, of course, lapses to Japanese whenever he can (which is totally natural). His casual speaking skills are likely fine but, naturally, when stressed or tired or distracted he is more likely to make errors and he seems unconfident when speaking in public - which makes sense because his public speaking is usually to media where it's more important that his thoughts are communicated as accurately as possible. He does seem to have good listening skills though because he shows understanding for questions asked in English as press cons before the translator has even started and waits to answer out of courtesy. Since I don't think he studies much my guess is that his listening and speaking skills are far ahead of his writing and reading though you never know because most find writing easier than speaking. I find people really exaggerate both his ability or lack of ability when it comes to English, thinking he's either more fluent than he lets on or completely unable to communicate. The truth is, I think, in the middle. His skills are fair and about as much as he needs to comfortably get through his daily life. haha it was from 2010. no worries.